Let me know if you know of any softball links which ought to be here. B&N Softball Page -- A lot of useful information. This page is run by a couple of engineers who apparently play a lot of softball. They test and review bats, balls, and other softball equipment. They also have a few articles on softball-related issues. I highly recommend investigating this page, particularly if you are thinking about purchasing some equipment. Amateur Softball Association -- The official site of the Amateur Softball Association. Not a very extensive page, but worth a look. National Softball Association -- Sharing its acronym with the National Security Agency, the National Softball Association appears to be the Amateur Softball Association's big brother. Or should that be Big Brother? In any case, their web page appears to be more extensive than that of the ASA, and probably has an elite security force watching your every mouseclick. Steve Dimitry's Slow Pitch Softball History Page -- The lengthy title is an apt description, although an even more accurate title would be "Steve Dimitry's Slow Pitch Softball Bonanza". Apart from the fact that I adore the word "bonanza", my proposed title does a better job of indicating the vastness of Steve's page. Of course, the size may be somewhat deceptive, given that Steve is either ignorant of, or actively detests, the philosophy of having a small index page. Take a look if you have some time on your hands. So why is it called WeaselFest? -- This page claims to answer that very question, and in so doing mentions an Ice Weasel. Quite strange. 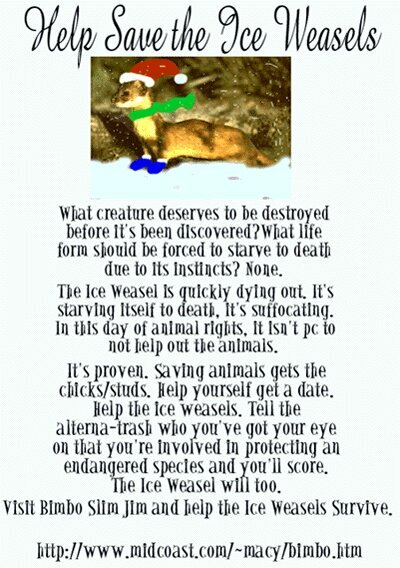 Save the Ice Weasels -- A movement to save the Ice Weasels. Also, be sure to check out this poster that was made for the cause. Weasel -- A simple title, a profound page. iceweasel.com -- Owned by Scott Ellsworth, an honorary Ice Weasel. Sheboygan Softball Association -- At one time or another, we've all wanted to visit the home page of the SSA, located in "The Slo-Pitch Softball Capital of Wisconsin." And who doesn't love saying the name Sheboygan? Say it with me: Sheboygan. There, that was fun, wasn't it?